From the items in your shopping basket waiting to be scanned at the checkout, to a bag of donated blood at a hospital on its way to a patient, barcodes are everywhere. These incredibly useful labels have been helping streamline business operations for decades, and their uses have only become more extensive over time. Barcodes provide virtually error free, instant data collection. Studies have shown that a proficient data operator will make one error for every 300 characters manually entered, compared to just 1 in 3 million when utilising barcode inventory systems. There are more uses for barcode technology today than ever before; the possibilities are almost endless. Here we’ll take a look at three industries where barcodes have essentially become ubiquitous. Healthcare makes use of barcoding technology in many ways, and it would not be an exaggeration to say that the implementation of barcoding into healthcare has likely saved millions of lives. Administrative mistakes in hospitals can have catastrophic consequences for patients, so barcoding solutions that reduce the possibility of human error have only positive outcomes for hospitals and patient care. Mobile healthcare professionals who are away from their primary care environment can utilise barcodes to access patient records, schedule visits and use location tracking to track caregiver location, document proof of visitation and create route plans to minimise mileage, fuel costs and vehicle wear and tear. Specimen collection – to ensure samples are tracked correctly. Inventory management – to maintain transaction information for drug products. Medication dispensing in pharmacies to ensure the right medication is given to the right patient and the stock is updated. Admissions – for patient identification via barcoded wristbands. Healthcare has really benefitted from barcode technology. The next time you pay a visit to the doctor, be aware of just how much information is processed in this way, from when you first step into the hospital to when you pick up your prescription. 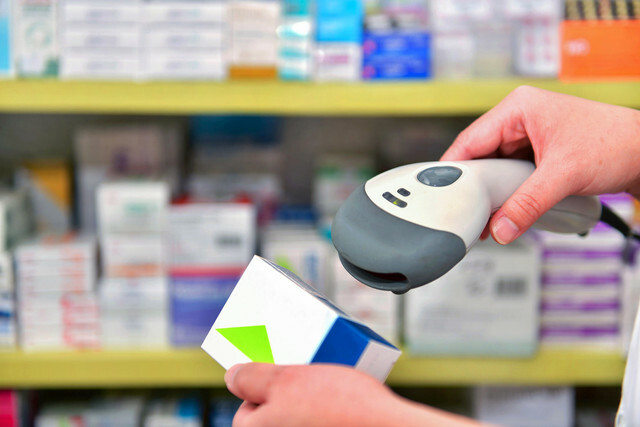 Perhaps the industry most synonymous with barcodes, retail has been using this technology to streamline their operations for decades. Go into any shop or supermarket and you will find a barcode on almost every single product available to buy. Barcodes have been used in this way to make the buying of goods quicker and more efficient. Most supermarkets have self-service checkouts for people to scan their own products without assistance, and some have even introduced hand-held scanners for shoppers to use as they shop to track what they’re spending. But it’s not just the consumer buying process in retail which has utilised barcode technology. Inventory control in warehouses where products are stored use barcodes to manage their stock by using warehouse scanning systems. The stock is labelled with a barcode to indicate its contents and where the shipment is heading to. When received, barcodes can then be scanned to update computers with completed orders. Barcodes also assist in streamlining the dispatching process to ensure that shops get the correct shipments. Because barcodes are used to record sales in retail, this data can then be used for marketing purposes. Manufacturers can record purchasing trends for products by easily assessing what products are selling well. But more prominent in the world of marketing, companies have been utilising QR codes to connect with their consumers through innovative marketing strategies. QR codes can be placed pretty much everywhere, inside businesses or on their promotional materials such as leaflets and posters. When scanned, these codes can take people to webpages or prompt them to download apps. Companies can use QR codes that link to their website or social media pages where all the relevant marketing info might not have fit on a printed advertisement. There are so many creative ways companies can utilise barcode technology to create unique marketing tools to generate public interest, and as this technology evolves, the innovation will be pushed even further. No matter what industry, barcode technology can be applied to help automate and improve the accuracy and efficiency of the data processing requirements. For all barcoding solutions and asset tracking systems, GSM Barcoding will have something to suit your needs.